There often is a little bit of excess fullness or fabric on either the border side or the quilt top. Whichever side seems more full, place towards the feed dogs when sewing. The feed dogs will help ease any fullness out. Today is the first day of Spring its nice to see it getting lighter in the evenings, and a bit warmer. Don't forget we are now online with products being added to the website as they arrive in the shop. We are still taking Expressions of interest for the class with Kaffe Fassett and Brandon Mably on Sunday 28th January 2018. We are also hosting a lecture on Saturday 27th January 2018. More details to follow. Lots of fabric has arrived in the last 2 weeks. You can also purchase the fabric online using our website if you prefer. Penned Pals a lovely range of children's fabric from Anne Kelle for Robert Kaufman there is also a free pattern using this range of fabric. Elephants by Dan Morris for Quilting Treasures. Kits to cover with your favourite fabric and make little sewing or Jewelery boxes. Shanon couldnt wait to get started and used some of her Tula Pink stash. Work in Progress ..... Sue has been enjoying hand stitching the Tula Pink English Paper Piecing pattern Tula Nova. Isn't it looking stunning!! Not much longer now don't forget we have most of your needs for the quilting classes. We are getting organised with all the goodies we are bringing with us. For the month of September its our Reproduction fabrics turn to be on Special.with 20% off. At the moment we are having a lot of quilts coming into be quilted with excess fabric in the borders. This disappoints us as we are not able to quilt your quilt as well as we would like and of course makes you unhappy as you might end up with tucks in your border. REMEMBER THE FLATTER YOUR TOP AND BORDER IS THE BETTER IT WILL QUILT. Please have a read of this tutorial from Moda Bake shop. If you require help with this please, please come and see us and we would love to assist you. Today our Bake Shop Basics series continues with Chef Anjeanette sharing the proper way to make and attach quilt borders. Hi Moda Bake Shop! It is Anjeanette from by Anjeanette. I’m going to share one of my favorite parts of making a quilt today. Do you ever finish your quilt and wonder why your sides are wavy and won’t lay flat? You may not have put your borders on correctly. Once your quilt top is all pieced and you are ready to add borders, it is tempting to just slap a long length of fabric on the sides, cut off any excess and think you are good to go. You have spent a good amount of time making your quilt top, it is a good idea to take this extra step to finish it correctly. Who wants a wavy quilt? 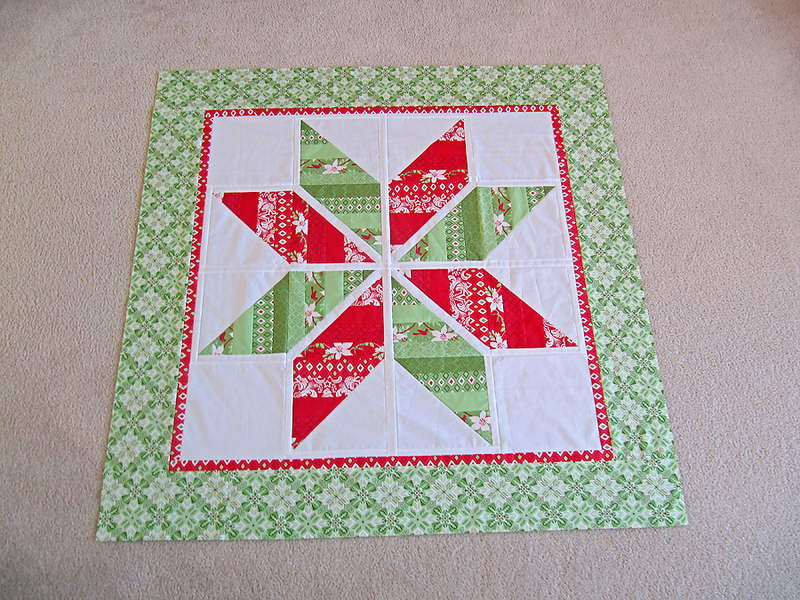 When you are ready to add your borders, lay the quilt on a flat surface. Measure through the center, from the top to the bottom. Cut two side borders to this measurement length. Taking one border strip at a time, fold lengthwise in half and then again into fourths. Place a pin at the fold points. You will end up with three pins in the border. Fold your quilt in half and then fourths, and pin the fold points. With right sides together, pin the ends of the border to the ends of the quilt. Match the center pins from the border and quilt and pin together. Match the quarter marks from the border and quilt and pin together. I then fill in between the pins with at least one more pin for each fourth. You may need to gently hold the fabric taught in front of the presser foot as you sew to help ease any fullness out. If it seems like there isn’t any fullness or excess fabric on either the border, or the quilt top, place the quilt top towards the feed dogs when sewing. After both side borders are sewn on, press the seam allowance away from the quilt top, or towards the border. Now repeat the whole process for the top and bottom borders. Lay the quilt on a flat surface. Measure through the center of the quilt, from one side to the other side. Cut two borders to this measurement. Pin the quarter marks on the borders and quilt. Pin the borders to the quilt matching pins. Pin the ends of the border and the quilt together. Etc. Using a walking foot for these long seams is helpful. It is okay if you have to piece or sew two strips together to make the total length measurement. Just make sure you are cutting your border to the correct measurement before sewing on. A perfectly flat quilt with borders. Until next time Sue, Shanon, Jenny, Annie, Judy and Natasha.